Earn money for music, movies, apps, and more.1 And never pay a monthly maintenance fee. 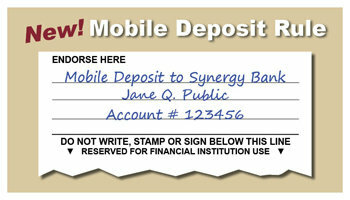 Do you currently have an account with Synergy Bank? That's it. Even if you don't meet your qualifications during the cycle, your Kasasa Tunes account is still free. And you can get right back to earning your full rewards the very next month! 1The minimum to open account is $50. You will be refunded up to $10 for refunds for any iTunes®, Amazon® or Google Play™ purchases that post to and settle account during the first 60 days after you open account. Refunds will be credited to account on the last day of statement cycle in which refundable purchases were made. In addition, each qualification cycle, earn up to $6 in refunds for any iTunes®, Amazon® or Google Play™ purchases if qualifications are met during previous monthly qualification cycle. Purchases must be made with debit card associated with your Kasasa Tunes account. Qualifying transactions must post to and settle the account during monthly qualification cycle. Transactions may take one or more business days from date transaction was made to post to and settle account. ATM-processed transactions do not count towards qualifying debit card transactions. "Monthly Qualification Cycle" means a period beginning one business day prior to the first day of the current statement cycle through one business day prior to the close of the current statement cycle. Domestic ATM fees incurred during qualification cycle will be reimbursed up to a maximum total of $45 per month and credited to account on the last day of monthly statement cycle. iTunes is a registered trademark of Apple, Inc. Amazon is a registered trademark of Amazon.com. Google Play is a registered trademark of Google Inc. Apple Inc., Amazon.com and Google are not participants in or sponsors of this program. Contact us for more information. Kasasa, Kasasa Cash, Kasasa Tunes and Kasasa Saver are trademarks of Kasasa, Ltd., registered in the U.S.A.
2All new accounts are subject to a $10 fee if the account is closed within 180 days of opening the account.